Tonight brings us the two-hour conclusion (CBS, 8-10 p.m. Eastern) of The Mentalist, one of the most interesting and thoughtful TV series of recent years. Starring Simon Baker as Patrick Jane, a consultant to the California Bureau of Investigation and then the FBI, the show leavened the fashionable gloom of modern-day police procedurals with Jane’s whimsical and refreshingly independent personality. Although Jane had a tragic past—his wife and teenage daughter were murdered by a serial killer whom Jane finally identified and brought to justice (execution, in fact), in the series’ penultimate season—he largely kept depression at bay and made a new life for himself by catching murderers while seeking the identity of the murderer of his wife and daughter, a serial killer known as Red John. Although Jane was far from perfectly content, that was understandable given the magnitude of his loss. It was a marvel to watch a modern TV drama continually convey the beauty of self-reliance and refusal to indulge in self-pity. As such, The Mentalist was never really part of the nation’s mainstream cultural zeitgeist, and I suspect that that is one reason for the show’s popularity; viewers could not get that sort of unsentimental toughness very readily elsewhere. Of course, the premise of the show dictated that Jane must eventually find his loved ones’ killer, regardless of how formidable an adversary that person would prove to be. Sherlock Holmes dispatched of Professor James Moriarty fairly quickly, one recalls, and numerous similarly villainous, though less formidable, villains arose to occupy his time and provide worthy enough adversaries. That became a problem for The Mentalist as the show wore on: the unrealistic nature of the hunt, with the preternaturally brilliant and manipulative Jane continually thwarted in his pursuit of Red John. The dance went on a season or two too long, for my taste, but the other qualities of the show sustained interest. Now, tonight, Jane finally receives the reward for his perseverance and pursuit of what is good, right, and salutary: marriage. How fitting that a show so devoted to values now widely considered somewhat old-fashioned should end on such a note. 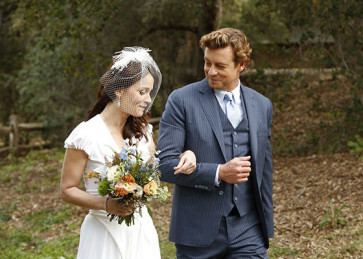 Long live Patrick Jane and his wife-to-be, Teresa Lisbon. Great point, Lars. All is not lost after all, lol. Yeah, they milked the Red John plot line past the bleeding point, but otherwise the show was pretty consistently enjoyable. And look! He’s wearing a tie in the photo! Traditional standards triumph! True, Lars. All is not lost, lol.